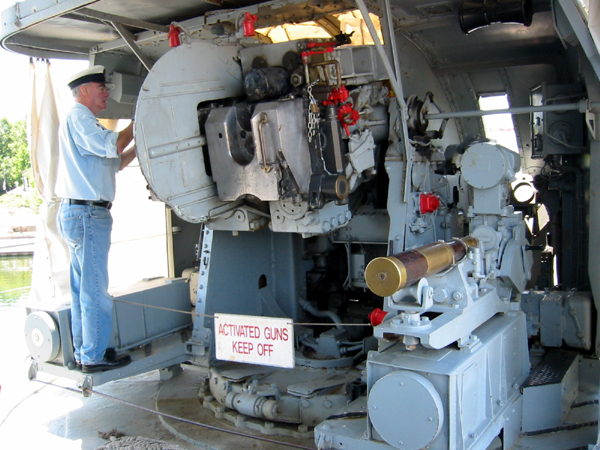 Click on image to fire the guns. 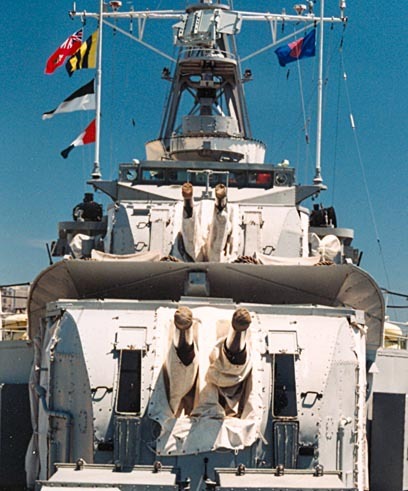 Standing at the bow and looking aft, are HAIDA's 4 inch guns. The lower mount is called 'A' gun and the upper mount is 'B' gun. These guns had a maximum range of 8 nautical miles. Technically speaking, these are twin, four inch HA/LA Mk 16 gun mounts. HA means high angle and LA means low angle. For these guns, the HA was 85 degrees and the LA was -10 degrees. When HAIDA was first commissioned, she was fitted with twin, 4.7 inch guns in the 'A' and 'B' mounts. 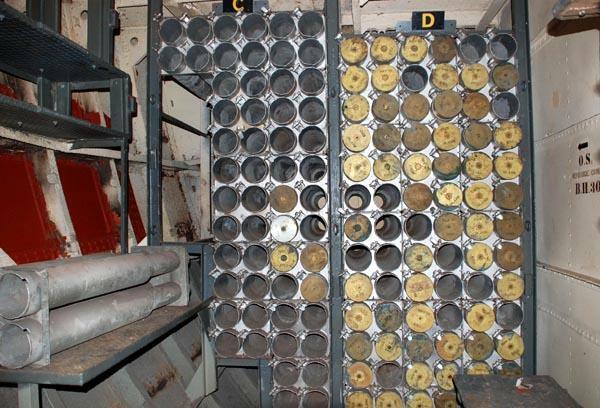 These guns could only be elevated to an angle of 30 degrees due to the ammunition tray which protruded behind the breech. This angle was sufficient when the principal adversary was other surface ships, however, the 4.7 inch gun barrel could not be elevated sufficiently to shoot at aircraft. 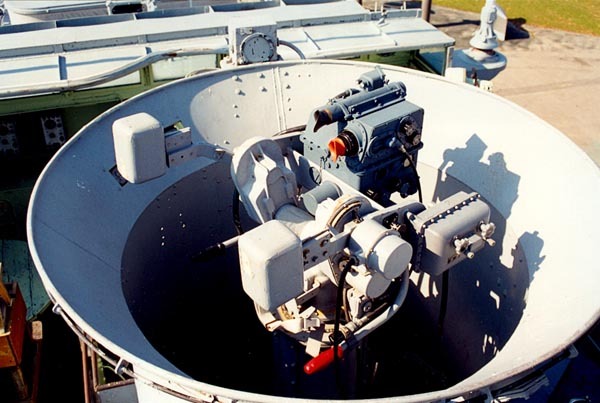 Prior to her tour of duty in Korea, Haida's forward 4.7 inch guns were replaced with the dual 4 inch mounts that are seen today. 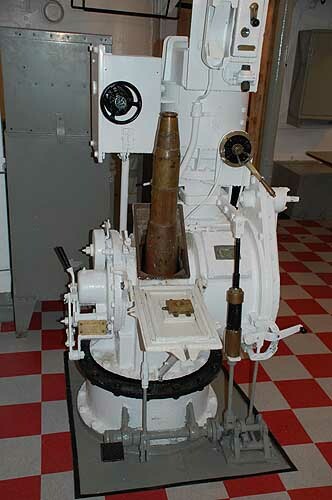 When fired, a 4 inch projectile left the muzzle at 2,610 feet per second and produced a "deck thrust" in the magnitude of 60 tons when the barrel was elevated to 45 degrees. Recoil was constant but the deck thrust varied with the angle of the gun. The range of the projectile could be upwards of 8 miles, again, depending on the barrel elevation. 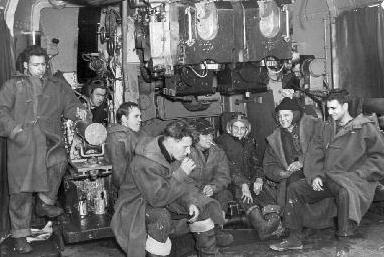 HAIDA's gunners had to be in good physical condition in order to load the gun because a 4 inch shell weighed 66 pounds. An "aimer" stood in between the two counterweights and aimed at the target by using the two optical sights mounted at the top. The upper sight (black eye shroud) was used to acquire the target while the bottom one (orange eye shroud) was used for visual tracking. As the aimer tracked the target, this motion was transmitted electrically to the gun. In order to hit a target, the gun must be fired in advance of the target's current position. This calculation is called "leadoff". The lead angle was developed by three gyro's fitted within the sight housing. There was one gyro for each of three planes of motion. Radar (AN/SPG34) was used to determine the actual range of the target at any given moment in time. Once the target was acquired, the aimer would squeeze the lever in the red handle and "uncage" all three gyro's. Range information produced by the radar was fed in electrically and would control the distance that the gyros moved. The longer the distance, the further the gyros travelled thus developing the lead angle. The leadoff was also affected by the speed of the target and whether it was moving left to right or right to left. Rifling in the gun barrel imparts a spin to the projectile in order to keep it from tumbling end over end, however this spin also causes it to drift slightly to the left or right depending on the direction of the rifling. At the same time, gravity is pushing the projectile downwards. Hence, all these factors need to be taken into account when developing the leadoff angle. The AN/SPG34 antenna affixed to the 'B' mount could control both 'A' and 'B' mounts simultaneously. The range difference, bearing and elevation were corrected by a parallax unit in the forward AN/SPG34 compartment.